A polite reminder that scarecrows are urgently required for registration at the village hall, 28th June at 9 -11, to be displayed along the Greenway, from Cromwell Lane Bridge to the National Grid wood. We had 27 scarecrows in 2012. We are hoping we can beat that this year. The competition is open to all. There is no theme. If you have been secretly knitting for us we are meeting at Deirdre's house, 28 Hodgett's Lane, Monday 23rd June at 6.35, to go to the National Grid wood opposite Rosemary Cottages on Hodgetts Lane. So please bring your stuff along or, if you wish, deposit in Deirdre's porch by the Monday afternoon. Or if you would just like to give a hand, you are very welcome. 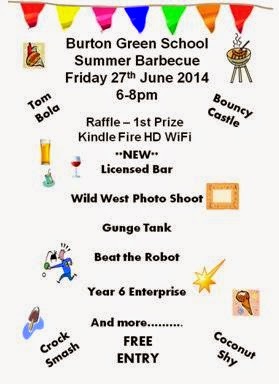 We intend to finalise the display on the Monday and if a nice evening we may make a start. All will be in place by the end of the week. Both the scarecrows and yarn-bombing will remain in situ until 13th July 5pm. That is the end of the open studios fortnight. Choir - Sunday 29th at 4pm. Scarecrow winner announcement after the choir at approx 4.30, on the Sunday 29th. Cafe with cakes light lunches, beer wine and Pimms for sale too. 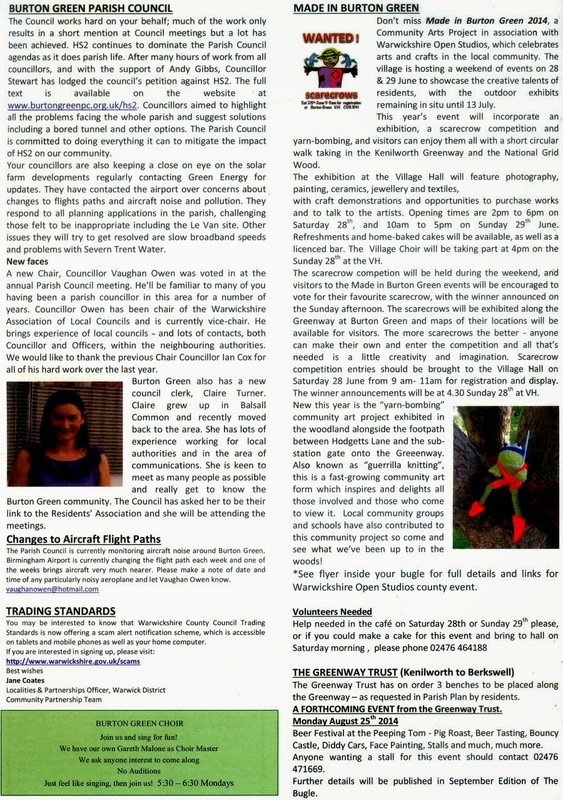 Open Studio Brochures for Warwickshire will be at the Hall on 28th June. Maximum height of scarecrow is 2 metres. Your scarecrow should show resourcefulness and creativity! Try to incorporate natural materials and / or recycled or found objects. Your scarecrow should be free-standing, so that it can be staged along the Greenway without disturbing the vegetation and wildlife. It could be upright or sitting down or be perched in a tree – you will be able to choose how it is displayed and the location. You may use props or accessories to enhance your scarecrow, but the organisers cannot be held responsible for any loss, damage or theft of these items, or of the scarecrows themselves. Your scarecrow should be inoffensive and designed in good taste and decency for a family audience. Entries should be brought to the Village Hall for registration on Saturday 28 June between 9am and 11am. You will then be given an entry number and can then install your scarecrow on the Greenway ready for the exhibition. Scarecrows can be collected from their positions after 5pm on Sunday 13 July. Any scarecrows uncollected after 6pm on Monday 14 July will be removed to the front garden of 293 Cromwell Lane for collection and subsequent recycling. The Made in Burton Green group reserves the right to photograph entries for promotional purposes, and the photographs will belong to the group. If a scarecrow is deemed unsafe in any way, the organisers reserve the right to remove it. You will be asked to give your scarecrow a name for the exhibition, so use your imagination to bring him / her to life and have fun getting creative! Please drop your entry form(s) in to Deirdre at 28 Hodgetts Lane, email your details to madeinburtongreen@me.com, or bring the form with you when you register your scarecrow between 9 and 11am on Saturday 28th June. 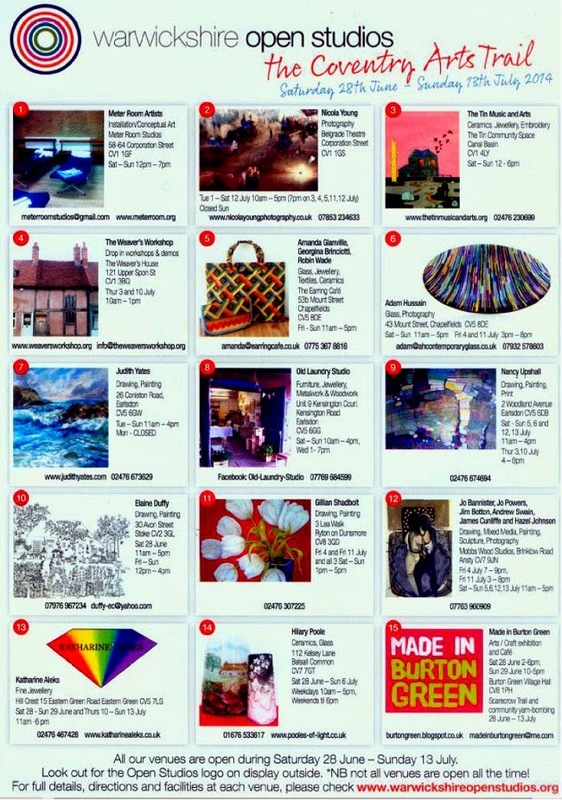 Don’t miss Made in Burton Green 2014, a community arts project in association with Warwickshire Open Studios, which celebrates arts and crafts in the local community. The village is hosting a weekend of events on 28 & 29 June to showcase the creative talents of residents, with the outdoor exhibits remaining in situ until 13 July. This year’s event will incorporate an exhibition, a scarecrow competition and yarn-bombing, and visitors can enjoy them all with a short circular walk taking in the Kenilworth Greenway and adjacent wood. 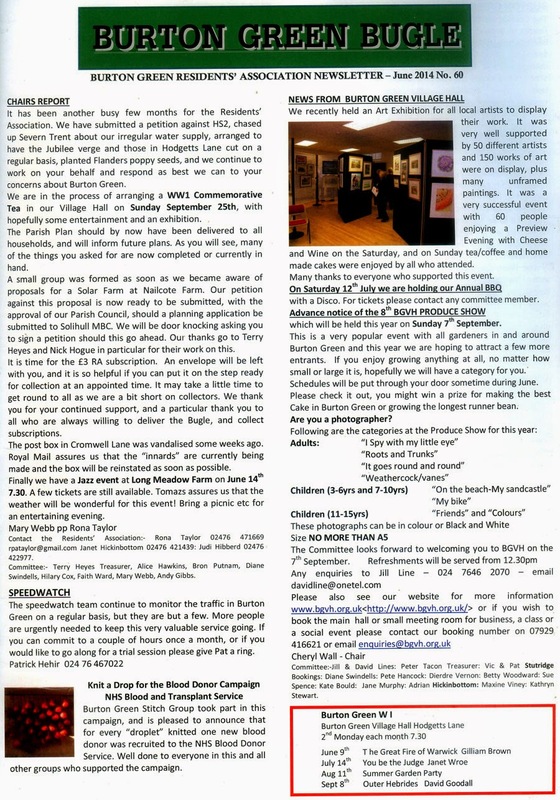 with craft demonstrations and opportunities to purchase works and to talk to the artists. Opening times are 2pm to 6pm on Saturday 28th, and 10am to 5pm on Sunday 29th June. Refreshments and home-baked cakes will be available, as well as a licenced bar. The Village Choir will be entertaining visitors at 4pm on the Sunday. A scarecrow competition will add amusement to the Greenway at Burton Green, and visitors to the Made in Burton Green events will be encouraged to vote for their favourite scarecrow, with the winner being announced at 4.30pm on the Sunday afternoon at the Village Hall. The more scarecrows the better - anyone can make their own and enter the competition, and all that’s needed is a little creativity and imagination. Scarecrow competition entries should be brought to the Village Hall on Saturday 28 June from 9am to 11am for registration and display. New this year is the “yarn-bombing” community art project exhibited in the woodland alongside the footpath between Hodgetts Lane and the Greeenway. 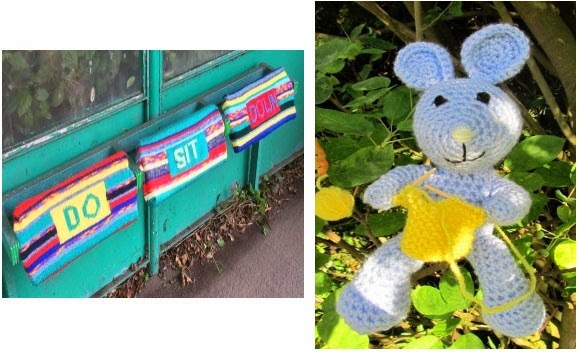 Also known as “guerrilla knitting”, this is a fast-growing community art form which inspires and delights all those involved and those who come to view it. Local community groups and schools have also contributed to this community project so come and see what we’ve been up to in the woods! 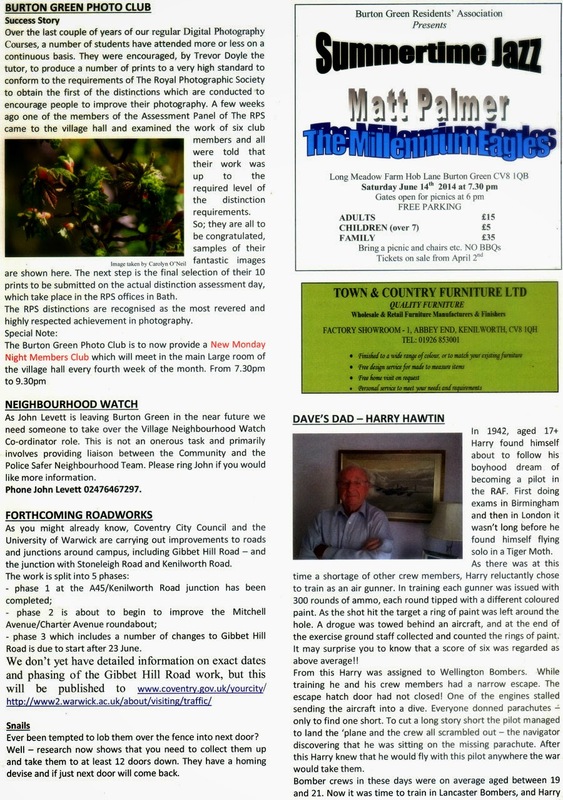 Burton Green Residents’ Association visit to Highgrove Thursday September 4th 2014. Traveling by coach is required for a group booking. The coach will make a coffee stop in Tetbury on the way, and allow time after the visit for a cup of tea in the tea shop at Highgrove. Visit time is 1.20pm. Payment for gardens has to be in by June 26th. Coach monies just before we go. There are 5 spare places available. 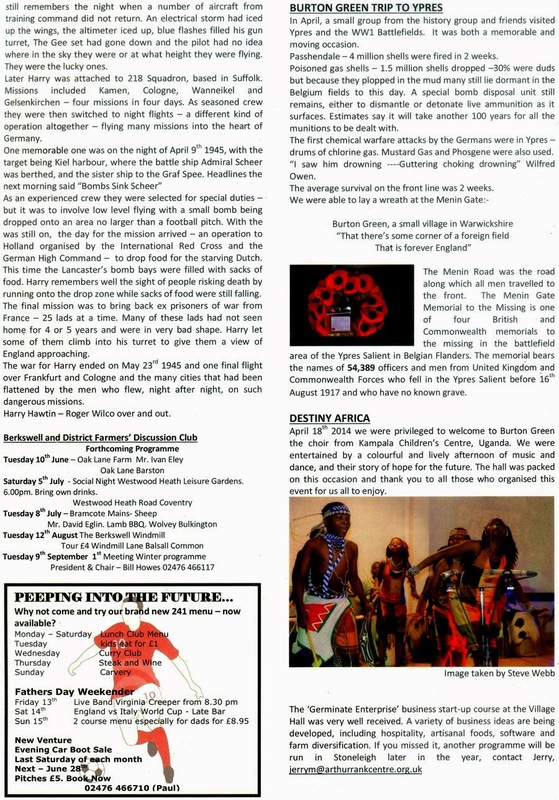 The June 2014 edition of the Bugle has been published.